Lawn Graves consisting of a desk shaped tablet made from polished natural granite stone. This memorial type is a long term option for commemoration and suitable for burial of cremated remains. 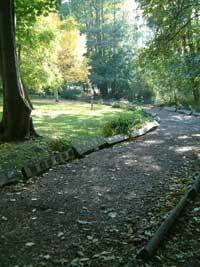 Woodland walk memorial plaques affixed to the logs lining the paths through a wooded area of the Garden. Cremated remains can be buried or scattered behind where the plaque is placed. Rose bush memorial plaques placed in pre-planted beds. Cremated remains can be scattered on the lawn nearby. Jewellery and Paperweights using a small amount amount of the cremated remains. Memorial seats with a cast bronze plaque. Cremated remains can be scattered on the lawn nearby. Flowering trees occasionally available in the grounds. Cremated remains can be scattered on the lawn nearby. Spring bulb commemoration planted throughout the grounds. The crematorium grounds are closed at 4.00pm (Oct - Mar) and 5.30pm (Apr - Sept). The Hall of Memory is situated behind the North Chapel and closes 30 minutes before the crematorium grounds. Further information or advice on memorials may be obtained by contacting Bereavement Services. If you feel the information available on this web page could be improved in anyway, please let us know.